I'm working on getting T's snacks a little healthier at the moment because they have got a little bad just lately. There are still a few treats in here but also some good healthly things too. I'm trying to create some little snack boxes for T as he seems to welcome those more than just a packet on a plate. 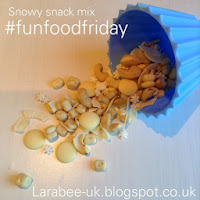 This mix went down very well, especially the excitement of having cake 'sprinkles' in there! I love this idea, both the snack mix and the fact that it has a snowy theme, bet it was yummy!